Yes, I went to see it again. On GSC’s digital screen. The cool thing about second viewings (if you’re like me) is that not only do you get to enjoy the good parts all over again and notice little things you didn’t notice before or had forgotten, but you also get a chance to observe more closely the details – the details in the designs and the cinematography, nuances in the acting or in the story, musical cues. I’m categorising this under “Reviews” but it’s more of a collection of observations and thoughts. A long collection of observations and thoughts. I shall break this up into segments, so it’s a little more organised. It’s mostly stuff I’d forgotten in the initial review (most of which was me gushing over how much I liked the movie). I really liked the character introductions for Captain America and Iron Man. 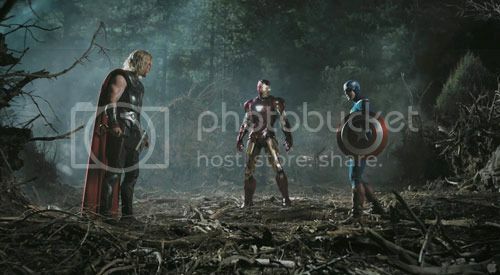 The way the dialogue was used to lead into each one was very effective: Nick Fury talking to the Council and saying that wars “are won by soldiers”, followed immediately by a shot of Steve Rogers venting frustration on a punching bag; Steve telling Fury that they should have “left [the Tesseract] in the ocean”, and then a shot of Iron Man in the ocean trying to disconnect Stark Tower from the central power grid. Very nicely done, and a delight to the viewer who catches little details like that. Hawkeye is the very first one of the Avengers that we see, and he’s “up in his nest”, keeping an eye on things at S.H.I.E.L.D. headquarters, where the Tesseract is. He’s a quiet observer until Nick Fury calls him down, and he shows that he’s sharp-eyed and alert (and a little grim). Natasha Romanoff, the Black Widow, is clever and strong, and knows how to use her feminine charms. She initially turns up as the apparent prisoner of a man she was investigating but who uncovered her real purposes. Agent Coulson calls her and upon hearing that her friend, Clint Barton (Hawkeye) is in trouble, promptly turns the tables on her captors and walks out with total calm and determination. Dr. Bruce Banner is a brilliant scientist and a good guy, despite the Hulk that lurks within him. His introductory scene shows him in the slums of India, helping the sick and poor, and he has to be lured out by a fake request for help. Steve Rogers is first shown alone in a training room – a very grounded, work-related sort of environment – and it’s a scene of quiet, pent-up frustration. Steve is a down-to-earth character, dedicated to his job, and he’s very much alone in the world as everything he knows has changed. Thor burst upon the scene in a dramatic way, accompanied by thunder and lightning. Thor is a character out of legends, and he is rather dramatic – very expressive and rather brash. Oh, and Loki. Loki’s the god of mischief and trickery. How appropriate that he should make a sudden appearance, and rise to his feet amidst swirling smoke that obscures him at first. I did think that Steve’s flashback needed to have Peggy in it. Perhaps they thought it would be too complicated to include her in the rapid montage there, but I think it would have made it better by reminding people that Steve lost more than just familiar surroundings and familiar faces – he lost the lady he loved too. There was a nice little build-up in terms of emphasizing poor Steve’s being so behind the times. He doesn’t understand so many things people refer to – e.g. there a reference to Stephen Hawking, and he didn’t get it because he has no idea who Hawking is – and then later is quite delighted that he actually understood a reference to “flying monkeys.” It does make him seem a little silly, but at the same time, one has to feel for the guy. No one likes feeling left out. He’s the most left-out person in there. The scene where everyone starts snapping at each other. I thought that was a rather high-impact one. By no means a happy scene, but it was set up and played out oh so well. It starts with Fury demanding to know what Tony Stark meant by hacking into the computer system, then Steve marches in and throws the Hydra weapon on the table, then Fury drags Thor into the argument… Natasha and Bruce kind of stand on the sidelines arguing with no one in particular. The camera goes in close to their faces, the emphasis on their annoyed/angry expressions; and the shots are cut with quickening pace until that one close-up of Loki’s sceptre on the table. Then the camera kind of does a 180° pivot over the sceptre and comes to rest on the other side of it, with the sceptre now in the top half of the frame and the arguing Avengers in view beyond it, upside down. The shot unsettled in a slightly dizzying way, but to great effect, since the unease was already building up before that with the multiple quarrels going on at once and the heroic team of the film seeming to fall apart. It thrilled the part of me that appreciates such editing and staging. Iron Man vs Thor … vs Captain America? I rather liked the three-way battle between Iron Man, Thor and Captain America. Well, two-way fight between Iron Man and Thor, I guess. Cap only showed up at the end and he didn’t fight Iron Man. He didn’t even really try to fight Thor. All he did was break up the fight by swinging his shield at the both of them – which came off rather funny in a cartoony way since the shield hit Thor’s head, and bounced off it to hit Iron Man in the head too, before returning to Cap. It had a… triangular trajectory? Making almost right-angle turns on hitting each one’s head. hahaha I chuckled to myself because Iron Man’s and Thor’s expressions at being hit in the head like that and the accompanying sound effects of the shield bouncing off them was just… amusingly cartoony. Thor in particular must have a skull of steel. That shot during the climactic battle in New York – the 360° turn the camera does around them as they stand in a circle, facing outwards. That was the moment when you just know they’ve somehow managed to come together as a team and it’s really working. I like that in the way it’s done, you see everyone of them in turn, and no one gets left out. A nice way to show them all off individually and at the same time send the message that yes, this is a team and you’ll have to deal with them all together. At the end of the movie, there’s that shot of Tony and Pepper in Stark Tower. 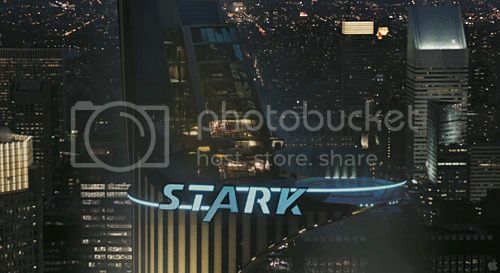 The camera pulls back from them and goes all the way out before dropping downwards a little so you see what remains of Stark Tower’s “STARK” sign – just the letter “A”. And it looks like the A in the film’s title… A closing reminder of who the film was about – the Avengers. Another nice little touch. This isn't the ending shot, but just imagine only the glowing 'A' left behind. It's the same "A" in "Avengers"
Thor trying to remind Loki of all the good times they had together in Asgard. Loki turns and says, “I remember a shadow – living in the shade of your greatness.” The line itself and its delivery really impressed themselves on me. Loki’s voice sounded like it was on the brink of cracking with angry, frustrated emotions on “I remember a shadow,” and I can think of times when I felt similarly – saying something and trying at the same time to retain control of myself and not break down or explode as I said it. A tiny, tiny detail, but I noticed and I liked it. Bravo, Tom Hiddleston. Actually, I think overall, Tom Hiddleston did a fantastic job as Loki – both in Thor and in The Avengers. In Thor, he’s a tragic character, driven to do what he does by jealousy and a warped sense of entitlement as well as a feeling of being wronged and betrayed. In Avengers, he’s clearly progressed from that to a sort of megalomania and desire for vengeance. The sinister smile, the knowing look that tells you there’s more to what he’s saying, the arrogant speeches (which Agent Coulson later undermines by pointing out that he’s just all talk and he lacks actual confidence in his actions) and the swagger all speak of someone who thinks himself superior. Captain America has good old-fashioned faith too? It makes sense that of all the characters in the movie, Cap would be the one to say things like that since being religious in the ’40s wasn’t as “outmoded” as it seems to be today. In that sense, it’s entirely in character. (Of course, I don’t know how comic book-accurate that is.) But it still surprised me because it never crossed my mind that they would allow any character to say stuff like that. No, I don’t think it is at all meant to be evangelical or preachy or whatever. I think it was just written in because (1) it’s funny in the context, and (2) it fits Cap’s personality and background. Nothing more to it. I’m highly appreciative of the line, and it makes me like the character even more (as Edge said: “I like that Cap is old-fashioned even in his beliefs”). But I’m not so deluded as to think that it’s a sign or some subtle attempt at preaching. Agent Coulson’s demise was sad, but one has to respect how he stood up to Loki as long as he could, and kept a brave face on it all. And maintained such a calm appearance, though facing Loki with nothing but a big gun. He was also polite. “Move away, please.” Polite, calm and brave. Gotta salute the guy. It was also really cute how he was such a Captain America fan and seemed awkward and awed to be around Steve. Agent Phil Coulson: I gotta say, it’s an honor to meet you, officially. I sort of met you, I mean, I watched you while you were sleeping. Agent Phil Coulson: I mean, I was…I was present while you were unconscious from the ice. You know, it’s really, it’s just a…just a huge honor to have you on board. I haven’t seen any of the Hulk movies, so it’s a bit hard for me to compare Mark Ruffalo with Edward Norton or Eric Bana. But from what I recall of trailers and pictures, I didn’t think Norton looked like a “Bruce Banner.” It’s as though he didn’t fit the name. But Mark Ruffalo looks like a “Bruce Banner.” (Not sure if that all made sense. haha) Also, Ruffalo played Dr. Banner very well, I thought – the brilliant scientist who’s rather afraid of himself in a way, and is always cautious and feels a little bit nervous, especially when he first joins the others on the helicarrier. He spoke in quiet, somewhat reserved tones, and his hands were frequently… fidgety? There was a lot of this uncertain clasping and unclasping of his hands, and wary looks around. Until he got into the lab, where he seemed to relax a little bit more – as though a lab is a familiar place to him (which I suppose it is, since he’s a scientist). Dr. Banner’s also something of a peacemaker. This was particularly obvious in the scene in the lab, where Tony Stark and Steve start arguing with each other. He tries not to get involved in the quarrel, and says diplomatic things – agreeing with Stark that yes, something’s definitely fishy about S.H.I.E.L.D.’s motives, but also agreeing with Steve in that Loki’s definitely got something up his sleeve too (and that something is that he’s trying to “wind them up”). Princess Leia would be proud of him. 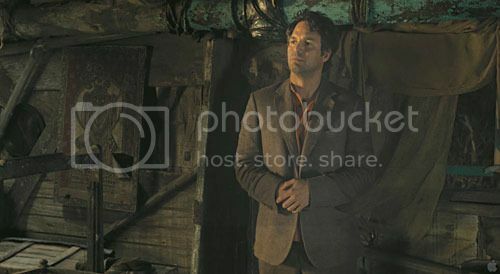 My favourite Bruce Banner moment was probably the one where he and Steve were looking over the side of the helicarrier, under the impression that it was a submarine. “Really? They wanted me in a submerged pressurized metal container?” says Bruce. Then the carrier starts to rise from the water. “Oh no. This is much worse.” There was just something in his tone of voice – a sort of wry amusement – that made it so funny. This didn’t occur to me when I first saw Avengers. But the next night I watched Thor and realised that it didn’t really make sense. They established – at the end of Thor – that he couldn’t go back to Earth because the gateway (the bifrost) was destroyed. And as far as we know, the bifrost is still unrepaired in Avengers. So how did Thor get back? Loki said something about Odin having to muster dark energy to send him back… in which case, how did Thor know Loki was attacking Earth? And how did Thor know about the Chitauri? He thought Loki was dead. So how did he find out that Loki was very much alive and had massed an alien army to back him too? The helicarrier security alarms don’t work. Or don’t exist. Steve, suspicious of S.H.I.E.L.D.’s motives after talking to Tony and Dr. Banner, breaks into the storage rooms and discovers HYDRA weapons, which use power from the Tesseract. I found it rather peculiar that S.H.I.E.L.D.’s store rooms appeared to have no alarm system rigged – he forced the door and not a single alarm went off anywhere. He could go in and look around and then bring one of the guns all the way to the Dr. Banner’s lab. Without triggering any alarm at all. That just didn’t make sense. Natasha needs to dream a little bigger? So he flew to the top of the Empire State Building, summoned some lightning… and then what? He doesn’t actually seem to use the lightning very much, though ostensibly he was supposed to. I just can’t remember him doing much with the thunder and lightning stuff. He did more with his fists and by flinging the hammer at the enemy soldiers. I very much appreciated the little details – such as how Iron Man’s suit was sputtering somewhat when he was flying back to Stark Tower to confront Loki prior to the battle in NYC. After all, he’d gotten quite a battering from the propeller when the bad guys prevented Steve from reaching the lever that would allow him to escape in time. It made sense that the suit would have suffered quite a bit. Logical physics combined with imagination (and a whole lot of patience to deal with tiny details) – that’s what really makes visual effects. I also liked that they designed the Hulk with a resemblance to Mark Ruffalo. According to the VFX supervisor from the incredible ILM (and according to the film’s prodcuer in the video above), it sounds as though this was a different design decision from the other Hulk movies? A very good decision it was too. It does ground the character in “reality”, and it’s a way of connecting Dr. Banner to the Hulk. I don’t get why they didn’t do that with the earlier versions. Another design detail I quite liked was the colours in Loki’s costume. It’s not green all over – in fact, the predominant colour is a sort of dark grey. But the green accents really make him stand out from the other major characters in the story. The gold trim helps too. Consider how Iron Man, Thor, Captain America and Black Widow all have red in their basic colour schemes. The only one who’s green is the Hulk, and well, that can’t be helped. haha I’d say, though, that the Hulk’s more of an olive green colour – closer to yellow – whereas the green Loki wears is closer to blue; it’s a cooler shade of green. Very subtle, and again, rather minor. But I like these small things. See? 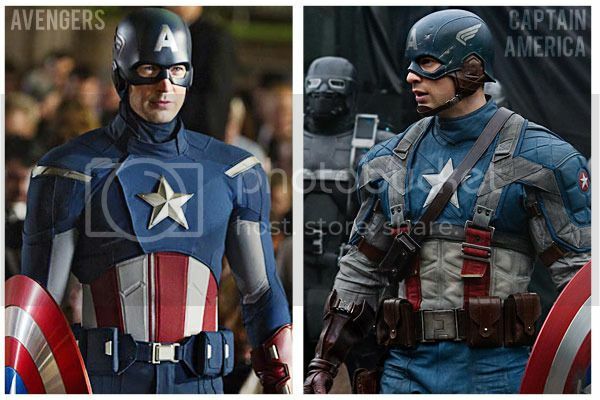 The one on the right – from Captain America – is sooo much better than the one on the left, which is the new version of his costume in Avengers. The former looks practical, and like a sensible rendition of what starts off as a stage costume; it looks more modern. The latter looks… almost exactly like a stage costume. How ironic.